Surveillance video released shows a Philadelphia police officer getting struck by a hit-and-run driver in Manayunk early Thursday morning. It happened on the 4100 block of Main Street near Shurs Lane just before 1 a.m. The police sergeant was standing at the window of a cruiser during a traffic stop when a 2008 Toyota Rav-4 driving southbound hits him and keeps going. The sergeant was thrown 15 feet. He was taken to Einstein Medical Center with injuries to his neck, shoulder, elbow, and knee. Police officers in Roxbourgh stopped the suspect about a mile away and took him into custody. 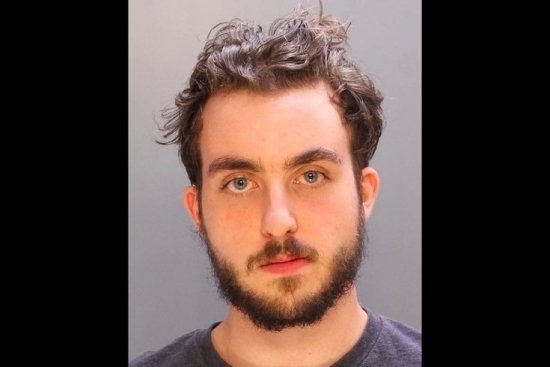 He has been identified as 21-year-old Colin Murphy of the 600 block of Appaloosa Street in Schwenksville, Montgomery County. He has been charged with aggravated assault while DUI, criminal mischief, DUI and related offenses. Two men and a teenager in Lancaster County have been arrested and charged for killing a turtle by blowing it up with firecrackers. It happened just before 7 p.m. on August 3rd in Penn Township. 21-year-old Taylor Geib, 21-year-old Austin Garner, and a 17-year-old boy are accused of duct-taping two M-80 firecrackers to the shell of a large turtle and lighting the fuses. The resulting explosion left a small crater in the ground with turtle remains. The three then fled. Police were called to the scene by witnesses who heard the explosion. They gave officers a description of the their truck and license plate. All three are charged with criminal conspiracy and prohibited offensive weapons. The teen is charged in juvenile court. Turtles are not considered domensticated animals in Pennsylvania and therefore the suspects can't be charges with animal cruelty. Philadelphia Phillies C Carlos Ruiz has been traded to the Los Angeles Dodgers for catcher A.J. Ellis, RHP Tommy Bergjans & a player to be named later. 21-year-old Colin Murphy of the 600 block of Appaloosa Street in Schwenksville, Montgomery County.